Spanish mountain bike brand Mondraker, best known for its Forward Geometry frame concept, has jumped on the e-bike bandwagon with a carbon 27.5″ plus bike called the e-Crusher. Officially today they announce this new bike, featuring their legendary frame geometry mated with a Shimano Steps E8000 motor. Exact specs to come. 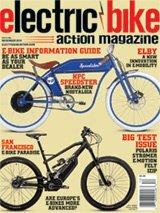 The e-Crusher will be distributed in the U.S. via QARV Imports in Colorado Springs, CO and will be available in select bike shops around the country in November.